Beautifully engraved certificate from the City Investing Company issued in 1973-1983. This historic document was printed by the American Banknote Company and has an ornate border around it with a vignette of two allegorical men sitting on both sides of a picture of a building. This item has the printed signatures of the company�s president and is over 20 years old. City Investing was a holding company with unites engaged in insurance, manufacturing, housing, real estate and community development. Their holdings included Home Insurance Company, Federal Home Life Insurance Company, Rheem Air Conditioners, World Color Press, General Developemnt Corporation, Guerdon Industries, Motel 6, California Savings and Loan, and more. In 1978 they had over 44,000 employees. Due to financial problems they were forced to liquidate the company. The City Investing Company Liquidating Trust (the 'Trust') was created on September 25, 1985, pursuant to an Agreement and Declaration of Trust ('Trust Agreement') by and between City Investing Company ('City') and the three trustees of the Trust ('Trustees'). The Trust Agreement is governed by the laws of the State of Delaware. On September 25, 1985, pursuant to a Plan of Complete Liquidation and Dissolution approved by stockholders of City on December 12, 1984, City transferred all its remaining assets and liabilities ('Trust Estate') to the Trust to assure compliance with Section 337 of the Internal Revenue Code. The sole purpose of the Trust is to liquidate the Trust Estate in a manner calculated to conserve and protect the Trust Estate, and to collect and distribute to the beneficiaries the income and proceeds therefrom in as prompt and orderly a fashion as possible after the payment of, or provision for, expenses and liabilities. 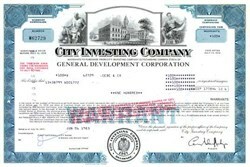 The common stock transfer books of City were permanently closed on September 25, 1985, and the holders of record of common stock of City as of the close of business on that date became holders of units of beneficial interest in the Trust on the basis of one unit of beneficial interest for each share of common stock of City held on September 25, 1985. After September 25, 1985, the outstanding certificates that formerly represented shares of common stock of City are deemed to evidence the same number of units of beneficial interest in the Trust. The Trust Agreement, signed on September 25, 1985, set forth a time limit of three years for the disposition of the Trust's assets and distribution to the unit holders unless a later termination was required by the Trustees. As a result of the protracted nature of certain litigation and other claims asserted against the Trust, on September 7, 1988, April 23, 1990, September 2, 1992, June 16, 1994, and June 27, 1996, the Trustees extended the time limit of the Trust's existence to September 25, 1990, September 25, 1992, September 25, 1994, September 25, 1996, and then to, September 25, 1998, respectively.